At times it can be all too easy to pick out a few venues across the country that fish reasonably well through the winter months. But at the risk of repeating myself I have to say that without doubt the Old Nene through March has to be regarded as one of the very best. It’s so consistent. No matter what the weather’s like, it shines through. In the latest match on the venue there was a string of double-figure weights taken with anglers catching 15lb plus of roach not making the main frame. Top rod was Alex Bates. He drew close to the Health Centre bridge and put together a 30lb 11oz net of roach fishing a groundbait and pinkie aproach. Just a few pegs away was Alistair Ogilvie. He fished similar tactics to the winner, although he did have a few better roach on hempseed late in the match, to weigh in 28lb 3oz for second spot. Tony Watling came third on 22lb 1oz followed by Martin Roper with 21lb 113oz. The Old Nene further back at Ramsey St Mary’s has also been in good form for those fishing the Ramsey AS matches. 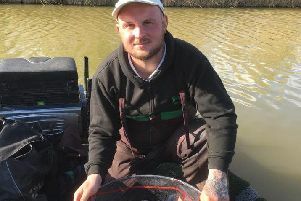 In the midweek match, Andrew Wilding drew peg four and caught small fish all day. He put over 200 fish to the scales for a winning 12lb 4oz. Runner-up was Keith Rayment with 8lb 13oz followed by Simon Wagstaff with 8lb 4oz and Ken Taylor on 7lb 6oz. Extra water and colour through the venue saw weights improve dramatically for the Sunday Open. Leading the way with 18lb 13oz of good roach taken on maggot, hemp and tares was Ken Taylor from peg 13. Bill Underwood took the runner-up spot with 16lb 14oz, catching on the whip with pinkie, then came Keiron Payne on 15lb 14oz and Malc Samsone with 14lb 5oz. It’s been tough going on all our local commercial waters and even those fishing the Decoy Lakes matches through the winter weather have struggled at times. On the Beastie Pool at the weekend matchwinner Stuart Bracey put a 20lb 4oz net of roach to the scales, then came Danny Carlton with 18lb 5oz and Nigel Baxter completed the frame on 12lb 1oz. Sunday’s open match was fished on the Damson Pool - a better bet in the cold weather as it holds a lot of small carp. Leading the way in this one was Wayne Sheperd on peg one. He caught on the long pole with pellet for a very respectable 78lb 9oz. Second from peg 10 was Tony Evans, who also used the pole and soft pellet approach for 74lb 11oz, and third was Danny Carlton on 62lb 2oz. There was a good turnout for the the New Year’s Day match spread across the Willows and Lou’s Pool. Top rod over both lakes was the in-form Tony Evans. He drew peg eight on Lou’s and caught well throughout the day fishing small popped up pellets on the bomb to finish with 95lb. Runner-up was Richard Bond. He drew peg 25 on the Willows and caught his fish on a small pellet feeder early in the match before switching to a pole line to finish the day with 69lb 8oz. Third was Greg Cooper with 49lb 2oz and fourth Simon Godfrey with 45lb 14oz. Both were on Willows. JVAC fished their latest club match on the Decoy complex fishing Horseshoe and Four Islands. Because the lakes are so different it was decided to run two mini matches. On Horseshoe Jay Richardson took the honours with 32lb 5oz from peg five, catching on pellet and maggot. Runner-up was Lee Kendall with 27lb 10oz, followed by Ray Pauley on 27lb 4oz. Over on Four Islands it was Ian Frith leading the way from peg four. He caught on the pole, alternating between pellet and maggot for a level 44lb. Second was Roy Whincup on 34lb 7oz, followed by Lee Marchant on 34lb 4oz.